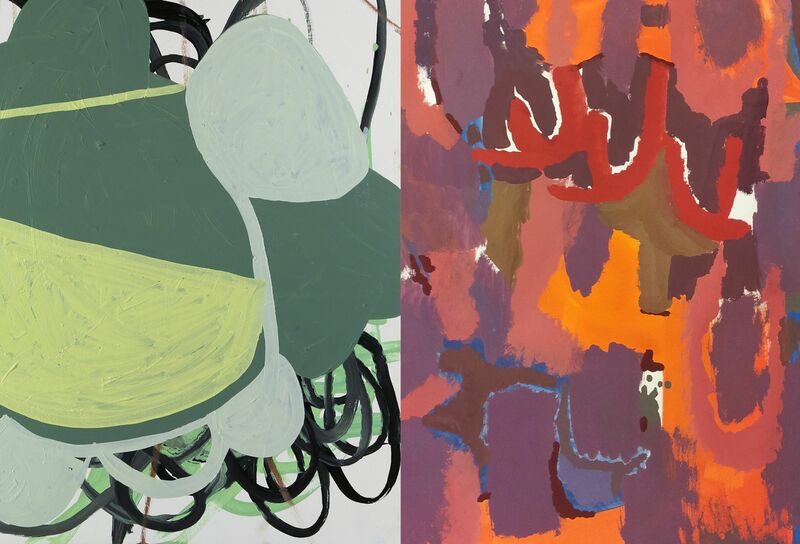 On 3rd Friday in October, Kiosk Gallery presents “Play” – an exhibition of paintings by Kansas City artist Liz Smith, and Columbia, MO artist Jennifer Ann Wiggs. Smith’s work is informed by the accumulation of visual information in her everyday life, while Wiggs draws inspiration from color and artistic action. Playful movement and lively interaction of color and shape are incorporated in both artists’ work. Stop by the artists’ reception Friday, October 16th from 6-9 pm, show runs through November 12th. left wall, Jenn Wiggs. right wall, Liz Smith. Liz Smith was born in Milwaukee, WI. She graduated from the Kansas City Art Institute in 1999, and received her MFA from the University of Wisconsin-Madison in 2002. Her first art heroes were her mother, followed by Cy Twombly. Lately it rotates between Mary Heilmann and Vincent van Gogh. Liz currently lives and works in Kansas City, with her husband Elliott Oliver and two awesome kids, Miles and Naomi. Jennifer Ann Wiggs has a BFA from Indiana University, an MFA from Washington University, and has taught art at the Art Department of the University of Missouri, Columbia. She is a member of the Watercolor USA Honor Society and her award winning work has been shown in Watercolor USA, the Living Artist’s Magazine, the Missouri Watercolor National, the National Exhibition of American Watercolor at the Taos New Mexico Museum, and the River Market Regional Exhibition in Kansas City.